Who wins - Dr. Doom or Akuma? Huge 1:4 scale statues from the Marvel vs. Capcom 3 video game. Dr. Doom stands 21-inches tall, while Akuma measures 19-inches tall! Display them separately or together. Two evils face off! Dr. Doom takes on Akuma! This huge Marvel vs. Capcom 3 Dr. Doom vs. Akuma 1:4 Scale Statue comes from the popular video game Marvel vs. Capcom 3. 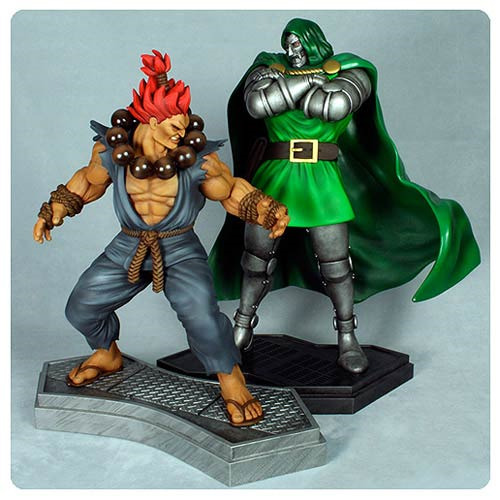 In 1:4 scale, Dr. Doom stands 21-inches tall in his armor, while Akuma measures 19-inches tall in a fighting stance. With MvC3-themed bases, the two statues can be displayed together or separately, or with future releases in the 1:4 scale Marvel vs. Capcom 3 series statues (sold separately). These museum-quality pieces are made from heavyweight polystone and then hand painted. Dr. Doom, the all-powerful ruler of Latveria, is captured here in a classic pose with his cape billowing in the wind, looking with disdain at his opponent. Akuma, the "Great Demon," is a cold and extremely powerful warrior whose sole purpose of existence is to hone his fighting skills by battling and destroying strong opponents. Ages 14 and up.